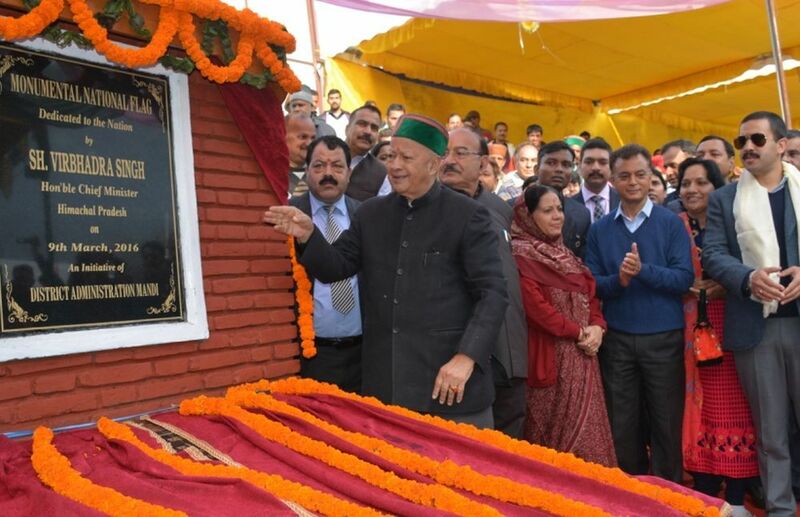 Mandi: Chief Minister Virbhadra Singh today hoisted the 100 feet high Monumental National Flag at Paddal Ground in Mandi. He was in Mandi to inaugurate the week long International Shivratri Fair. This was the third such Monumental flag dedicated to the Nation by the Chief Minister, the first two being at Kullu and Shimla. Earlier yesterday, after presenting the Annual Budget 2016-17 in Shimla, Chief Minister Virbhadra Singh took-off to Mandi in the afternoon to participate in the famous International Shivratri fair. After being accorded warm welcome in Mandi, the Chief Minister participated in the traditional ‘Jaleb’ (Shobha Yatra) after paying obeisance at the famous Madho Rai temple. Over two hundred Devtas participated in the Jaleb which had come from almost all corners of the district. The Chief Minister, while addressing the gathering at Paddal stadium, announced 10 percent increase in Nazarana of the local deities. He said that the life of the people of the state revolves around the local god and goddesses and the local deities were inseparable part of the people of the state and participate in almost all the day to day activities. “We should perform all the religious ceremonies as per the traditional practice and customs”, he said. He said that it was evident from the history the civilization who failed to preserve their culture and customs, had completely vanished. Our identity was our unique culture and traditions.